She also told the audience that “Don’t use your competitors as the bar against which you measure yourself. Ask yourself, what was the last best experience your customer had? Regardless of where hey had it. That’s your bar.” – This really resonated with me and I invited her onto the podcast to tell me more about how IBM is much more than a tech company and were ranked a leader in Gartner Magic Quadrant™ for multichannel marketing hubs last month. 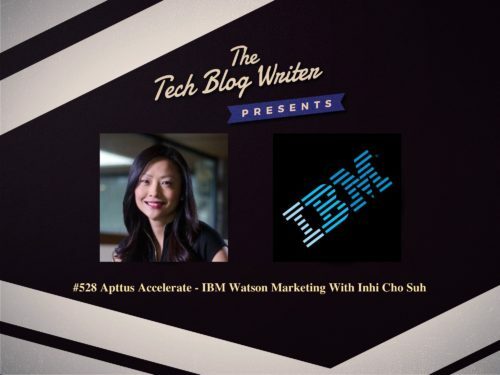 I also wanted to find out more about how Apttus’ intelligent middle office platform will be coming to the IBM Cloud so caught up with her at the event for a quick chat. Inhi Cho Suh is the General Manager, IBM Collaboration Solutions. Inhi began her career with IBM in 1998, joining the worldwide customer set strategy team for IBM’s Personal Systems Group. She then went on to hold a variety of leadership and management positions focused on strategic growth, development, and marketing. Most recently, Inhi was the Vice President for Big Data, Information, Integration, and Governance in IBM Software Group, responsible for all areas of the business. Prior to joining IBM, Inhi was a consultant in the education sector focused on international student teaching and counseling for university and professional institutions. Inhi received a Bachelor of Science from Duke University and a Juris Doctorate from North Carolina Central University School of Law. She is a licensed attorney in the state of North Carolina. Previous Post529: ClearSky Data - The Edge or the Cloud?